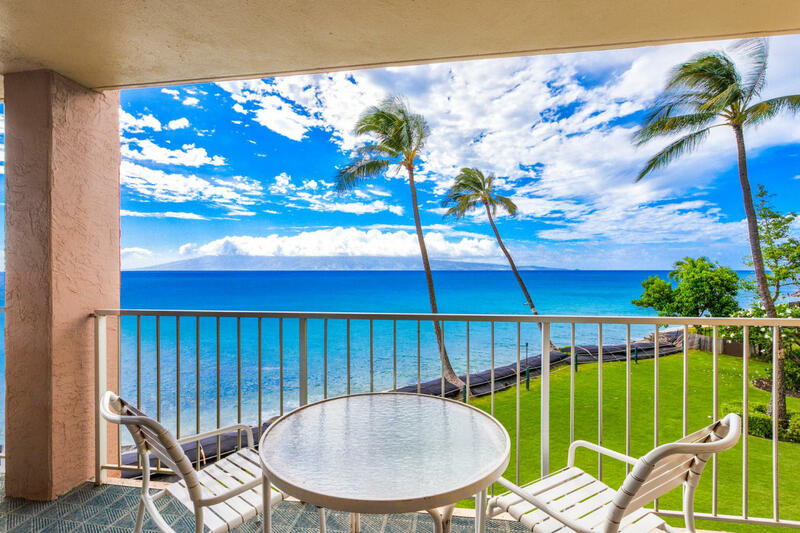 This 1400 square foot, 2 bedroom, 2.5 bath home boasts a magnificent WRAP-AROUND LANAI with an unobstructed oceanfront view encompassing the islands of Molokai & Lanai. 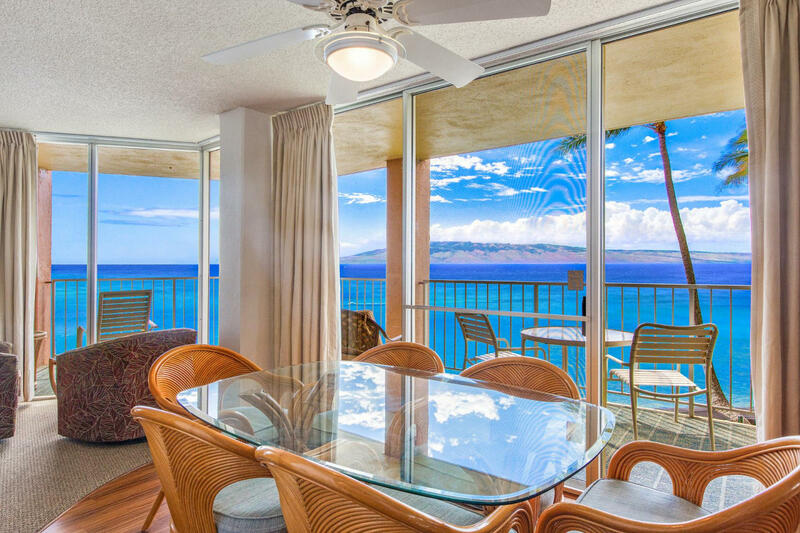 The second floor location is ideal for watching whales, viewing Kahana Bay or enjoying an evening beverage while watching a magnificent Maui sunset. This home is on the buildings quiet side, allowing you to enjoy the sounds of the ocean, while relaxing on the lanai or in the master suite. Each bedroom features an en suite bath and separate vanity area. There is also a fully updated half bath adjacent to the living area. The Royal Kahana Resort is located on the beautiful West Coast of Maui in Kahana and is surrounded by Maui's spectacular natural beauty. The lobby has been completely remodeled, with an on-sight CONCIERGE DESK located in the large sitting area, enabling you to book all your fun activities! Lounge at the oceanfront pool deck, barbecue poolside, or whale watch from the private lanais (in season). Our unit is an excellent choice for families or couples wanting a comfortable unit with great views and amenities, and most importantly-value! Just steps away awaits an ocean of recreation. 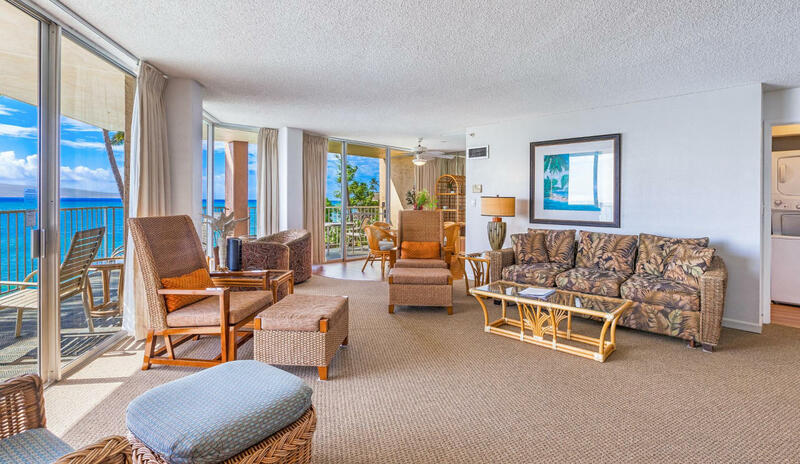 With our prime oceanfront location, the Royal Kahana offers swimming, snorkeling, & wave paddling in the sparkling Pacific waters that splash its shoreline, just a quick ride down the elevator & out the lobby door. You can swim in the pool or sun yourself on the deck, or on the spacious lawn fronting the building. PARKING IS FREE and we also provide FREE SECURE WI-FI in the home. Our family owns several homes at the Royal Kahana, however this particular home is owned by a dear friend, Heidi. The Royal Kahana location allows guests to enjoy the dining and night life of the historic whaling town of Lahaina, the world famous beaches, shops and restaurants of Kaanapali, or the more upscale spas, shopping and dining of Kapalua. All within a 10 minute drive. Our online Representative is Trinity Maid Co.,Inc. A trusted and wonderfully reliable service.